Green manures / covercrops (GMCCs) are widely recognized as having potential to help farmers improve crop yields and maintain high soil quality. Developed by the International Institute of Tropical Agriculture, 2-4-2 is an intercropping strategy in which two rows of maize are alternated with four rows of cowpea. 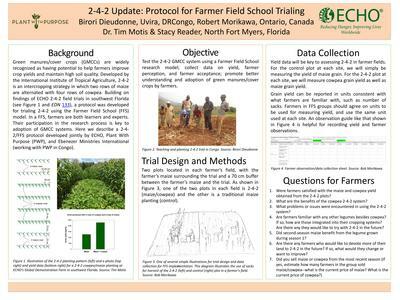 Building on findings of ECHO 2-4-2 field trials in southwest Florida, a protocol was developed for trialing 2-4-2 using the Farmer Field School (FFS) model. In a FFS, farmers are both learners and experts. Their participation in the research process is key to adoption of GMCC systems.